According to the Houston Chronicle, It takes a smooth and practiced hand to load container ships at Port Houston. With two joysticks and myriad buttons, crane operators must hoist cargo over the side of an expensive vessel and onto an already massive stack of metal shipping containers. Developing that touch takes time, a luxury no longer afforded to the increasingly fast-paced maritime sector. There’s little patience for trainees slowing down operations. “Production falls below a certain point, they’re going to pull that guy out,” said Alan Robb, International Longshoremen’s Association president for the South Atlantic and Gulf Coast District. 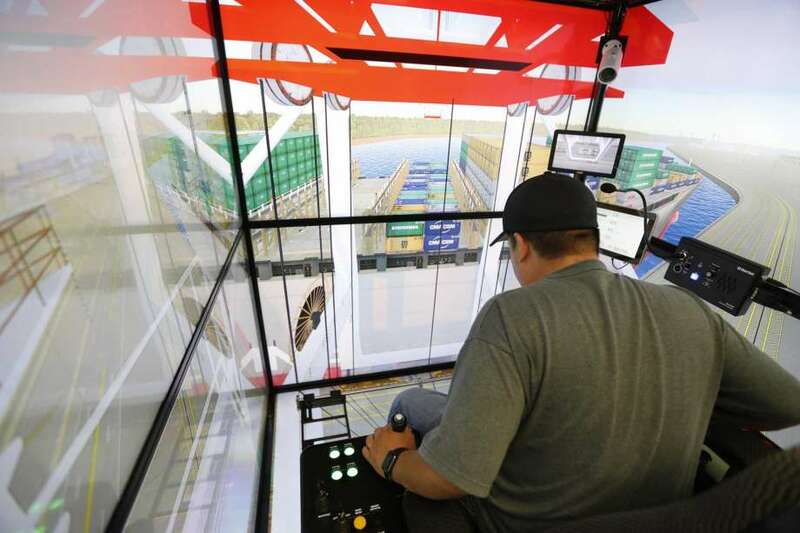 So to increase a work force crucial to the port’s future, the West Gulf Maritime Association and Port Houston spent more than $500,000 on two simulators that they will officially unveil on Thursday. All of this is expected to accelerate the port’s container business, which handled more than 2 million of the 20-foot-equivalent containers in 2015. That number ballooned to 2.46 million last year. “All of our livelihoods and ability to grow are dependent on the people whom operate these cranes,” Port Houston executive director Roger Guenther said. The port is likewise investing in new equipment. Three ship-to-shore container cranes and five rubber-tired gantry cranes, used to stack containers within the terminal, are currently en route to Houston. That will bring the operational crane totals to 26 and 85, respectively, at Bayport and Barbours Cut container terminals. The ship-to-shore crane simulation uses seven monitors: two on the left of the crane operator, two on the right, two in front and one below. The monitor underfoot provides vertigo-inducing views, akin to what crane operators will experience on the docks, and the participant’s chair moves in accordance to the simulated crane. 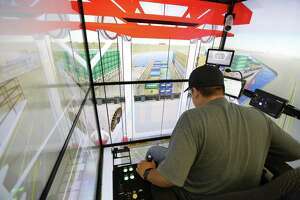 Ideally, two weeks in the simulators — and several additional weeks in an actual crane — will get new operators to more quickly meet the expected standard of moving 30 to 35 containers each hour. It’s also a safe environment for learning to operate in high wind or emergency situations, such as when a mooring line snaps. “If they mess up, the screen just ‘cracks’ instead of the crane falling into the water or something like that,” said Jason Meneley, president of CP Tech, the company that conducts training on the simulators. Roberto Alvarado, 38, was in the simulator this week preparing for a job he has long aspired to hold. Alvarado’s first job with the International Longshoremen’s Association, nearly 16 years ago, was in the hull of a ship. He labored to put chains and nylon straps around steel so it could be lifted from the vessel. He envied the crane operators. “I said, ‘One day, I’m going to be there,’” he recalled. Alvarado worked his way up to the smaller onboard cranes used to unload steel. Now, he’s working to be certified on the massive ship-to-shore cranes that move containers. He said the simulator is helping him get used to the new vantage point. Crane operators are selected from the most experienced International Longshoremen’s Association workers, and they can earn $100,000 to $250,000 a year. The association’s Robb praised the West Gulf Maritime Association and Port Houston for purchasing the simulators. He said keeping up with the demand for more workers is paramount to both the maritime business and economy overall. Simulators will be key. “I think it’s probably one of the smartest things that have been done in the maritime industry in a long time,” Robb said.